Fes (Fez), the third largest city of Morocco is widely known for its two medinas (old towns). The larger one of these medinas, Fes El Bali, is listed as a UNESCO World Heritage Site. This medieval world treasure is the world’s largest car-free urban space also. Talking about the origin of Fes (an Arabic word for ‘Axe’), it is believed that the name comes from ‘Fazaz’ - the old Berber name of the Middle Atlas Mountains. Fes is known by its two other names, one being the ‘Athens of Africa’ and the other one as the ‘Mecca of The West’. This spiritual city has special importance in the lives of Muslims all around the world that is why some spiritual leaders named it as their final resting place. This heritage site remained unchanged for a long time, but with the onset of globalization most of the people here understand French and English along with their native Arabic language. Despite its traditional spirit, you will be able to find ‘New City’ – a lively commercial centre. This mix of history with modern culture makes it exciting for tourists to explore the city of Fes. Fes became famous as a tourist destination just fifteen years ago. This city is developing at a rapid pace and if you haven’t been to a developing city yet, it can be an intense experience. However, the best time to visit this place is from September to November. If you are unable to plan your trip during these months, then visit here from April to June. It is highly recommended to go with the second option as The Fes Festival of World Sacred Music usually occurs in June, and it is worth enjoying. Moreover, these are the ideal months as the weather is not too hot. The city has a Mediterranean Climate and the days can be very dry and hot in summers while rainfall only occurs in winters. Buses and trains can be used to reach all the other attractions. Have you planned to visit Marrakech also? Just don’t spend a lot of money on ornaments in Marrakech as you will get these at a much cheaper price in Fes. There are thousands of narrow and winding streets (which might reach a dead end) and you will find yourself walking a lot. The easiest way to understand the structure of this city is to remember that it is shaped like a bowl. So, if you are not a huge fan of walking all day long, take a Petit-taxi. Most of the tourists visit Fes just to see the Medina. This is one of the biggest car-free urban medinas in the world. It will be best to hire a guide or you will miss some important sights. You can explore the city on your own too, as there are plenty of English speakers in this city now. Upon entrance to the city, your hands will itch to capture the beautiful yet giant four gates (covered in tiles) with your camera. From here, you can shop for crafts, pottery, rugs, slippers, good quality leather and trinkets. Moreover, there are a huge number of cafes, tea shops and other stalls with a welcoming aura. The people will welcome you with smiles on their faces and will not hesitate to tell you some interesting stories also. The market is also completely organized and clean. Explore the row of stores but buy only what you really need or you might end up buying a ton of beautiful products which can be hard to carry later. However, there are maximum chances of ‘getting lost’ and it will be impossible to find your way back, if this happens ask any local for the exit side of the medina. This crazy, huge, ancient and traditional place is worth shopping and getting in the fun mood. Popularly known as the most beautiful cultural destination, Fes El Bali attracts a lot of tourist every year. Make sure to buy a good map or hire a guide, otherwise you might get lost and only shopkeepers will help you to find your way back. The most enjoyable thing is to go around the alleys in order to find a donkey drinking from a spectacular fountain. You can visit Bab Bou Jeloud, which looks even more impressive because of the rooftop restaurants. What brings tourists to this place is its amazingly new atmosphere with vibrant colors, exotic smell, and different climate, daily routine and enchanting sounds. Every activity will give the feel of something new and unique in its own way and there is not a slightest chance of getting bored while exploring the place. It is worth spending a full day or two, because you won’t be able to get enough of the historical sites, tanneries, beautiful mosques and the delicious food. Kairaouine Mosque and University holds the title of being one of the oldest universities in the world and as one of the largest mosques in Africa. This university was founded by a woman named Fatima, who loved science and education. The only drawback is that non-Muslims are not allowed inside this place, but you can enjoy the view through the gates. However, you can ask a guide or a local Muslim to go inside and capture the beauty of this place in your camera. Just the photos of its beautiful décor, mosaics, colorful roof dome can make your day. This huge mosque has the capacity to accommodate more than 20,000 people at a time of prayer. Moreover, you will be amazed to see that being so old, this place is very well maintained. Just walk around the university and you will find a plaque telling you about the part of university you are in, to give you a general feel about the inside part. There is even one library that you can visit here and it is known to be one of the oldest libraries in Africa. Seeing the huge wood door to the courtyard and the Mihrab with awesome Arabic carvings will leave you speechless. Attarin Medersa is said to be founded by Abu Said and lies in the heart of Medina. Medersa is the other name for the Islamic schools; hence you will be allowed to visit the courtyard only as it is restricted to enter the room of old students. If you are a fan of architecture, then you shouldn’t miss this place with a beautiful view of Arabic scripts. One of the best preserved places in Morocco, this place will give you an amazing peaceful feeling after an exhausting day. Hire a guide to get to know about the historical importance of this place and make sure to click pictures of the beautiful artwork, carving and other impressive parts of this old building. One can even visit this place just to relax or meditate as it provides a glimpse of heavenly peace. You can even find the loveliest fountains here. The scenic Jardin Jnah Sbil is a park that serves as a beautiful distraction from the ancient buildings covering most of Fes city. Most of the tourists are pleasantly surprised to visit this quiet and calm park in this city that is full of life and interesting corners. There is a beautiful lake along with benches, so make sure to spend at least half an hour to explore the beauty of this place. There are a lot of flowers all around the garden. You will see bamboo and palm trees lined up on either side of walkway. One can even find some colorful paintings near the fountains. There is a café just outside the park. Moreover, it is within walking distance from the Bab Bou Jeloud who is also known by the name Bou Jeloud garden by the local people. It can be quite hot sometimes in the noon, thus this shady garden can serve as a good place to get rid of the sun for some time. 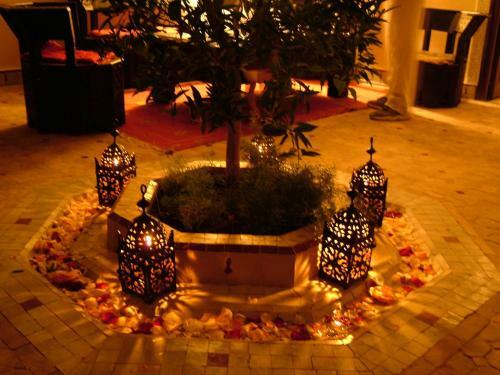 Don’t miss the ‘scent garden’ at one corner, where you will find various aromatic herbs like mint, rosemary and sage. Nejjarine Museum of Wooden Arts and Crafts opened in 1998 and displays ancient wooden gadgets, musical instruments, kitchen tools, chests etc.. This museum is well-maintained and every item is presented beautifully, but what makes it stand out amongst the crowd is the stunning building itself. The only drawback is that it is restricted to click photographs; however this place is worth visiting just to enjoy the great view of medina from the rooftop café. The entrance fee is minimal, but the restrooms are quite clean. In fact, you will be able to enjoy every item inside this museum within an hour as the items are organized in a way that it will consume less time. Make sure you know French or take a guide with you as there is nothing written in English. This museum is open seven days a week, so you can take a break from the heat outside and enjoy the wooden tools. The Chaoware Tanneries are famous for being one of the most iconic sights especially known for its leather products. However, if you can’t stand the smell of leather and dyes then skip visiting here. What makes these more exciting to visit is that the tanneries have been in use since the medieval times and are very less changed. Just head into a leather shop full of various jackets, slippers and handbags. The shopkeepers will show you various leather products in awesome designs and colors and it will be hard to resist buying these beautiful items. It is best to view the tanneries from these shops or from the terrace. Don’t forget to take a sprig of fresh mint because the smell of this place can be too ‘pleasant’ to tolerate due to the stinky animal poop. The best time to visit here is in the morning as different pits soaked with colored dyes look ready to be captured. Make sure to get information about the treatment of hides and get to know about various dyes that come from the plants of a shopkeeper. However, you will not even have to ask for directions, as the smell acts as an ultimate guide and eventually lead you to this place. The Mellah or The Jewish Quarter, is one of the oldest mellahs in Morocco, with a walled boundary. This place is worth the visit because the architecture differs from the rest of the city, hence making it a unique place of its own. It will give you a glimpse of Jewish culture because of the houses with balconies and windows over-looking the streets which are very Un-Muslim like. History reveals that these Jewish quarters were located near the royal residencies which enabled the people belonging to the Jewish community to be protected from the wrath of Muslim masses. Originated in 1438, this place proudly represents itself as the first established ‘mellah’ in Morocco. The workers over here are very friendly and will tell you openly about their skills and various masterpieces. The synagogue and graveyard are known to be the most fascinating sites. However, it is advisable to take a guide or you can easily lose yourself at this place because of unmarked and slightly confusing streets. The streets can get very crowded after sunset, because almost every shop is open at that time and you can see a number of street vendors too. You just can’t miss having a taste of the traditional food with a unique flavor over here. Medersa Bou Inania was built in the 1300’s by The Merenid Sultan Bou Inan and presents beautiful examples of Merenid plaster and wood work. It went under renovation a few years ago and is known as the finest of the theological colleges in Fes. Most of the medersas include a simple prayer hall, but it hosts a complete mosque. It is because the medersa required a large-scale mosque at that time as there was none nearby, thus it acted as a mosque along with an educational centre. Take a guide and avoid hassles as Non-Muslims are not allowed inside during prayer times. The courtyard is decorated beautifully and the green-tiles minaret never fails to impress the tourists, it is the only medersa in Fes with a minaret. It holds the title of being the ‘last medersa built by the Merenids’. The craved woodwork and the roof top offering an amazing view of the city makes this place worth visiting. You will be amazed to see that even after renovation the original beauty of this place seems untouched. This place serves as a great break from the crazy crowd on the streets. You will even find a large open area with a small pool in the middle. You will be able to see local historical architecture with Arabic scripts in front of your eyes and your guide will fill in the historical information. The place is quite peaceful and gives a feeling of spirituality. The Merenid Tombs are located just outside the walls of the old town. These tombs can be seen from the rooftops of the city. The interesting fact is that most of the tourists head up to the hill to the tombs to get a spectacular view of the sunset in this city. Moreover, the city looks amazing when the sun is about to set and hence makes this place quite photogenic. The whole place gives a soothing experience when the lights come on and the sound of prayers echo around the valley. Dating back to 14th century, these tombs housed many Sultans. Tourists even use this place to have lunch and there is no requirement of a guide too, as it is just twenty minute walk downhill back to the medina. However, there is nothing much left to look in the tombs itself as these are in their last stage of ruin. Borj Nord was built by Sultan Ahmed al-Mansour in 16th century. It was created with a motive to monitor the potentially disloyal population of this city. It was used as a cannon factory. This fortress has a very impressive arms museum with a wide collection of weapons. These weapons include some extremely rare piece representing the armory from all across the world. Don’t forget to view the 5 meter long cannon, which were used during the battle of The Three Kings. This building serves as an excellent place to walk and take in all the historical facts. This organized and clean place is very well maintained and there is a minimal entrance fee. Along with the collection of weapons, there are various models and explanatory diagrams. There is an elevator to reach the terrace and the cafeteria on the top which serves excellent coffee. The terrace was designed especially with four bastion shaped spearheads to withstand the weight and cannon fire. Sefrou, a walled town, is nothing less than an absolute heaven for photographers. It served as a major point during the caravan trading routes and it was known to be a prosperous centre. There is a feeling of untouched atmosphere and this place is completely quiet and different from the rest of the city. However, due to lack of renovation and proper preservation it has lost a bit of its historic charm. Still, one can’t miss taking photographs of some gorgeous buildings at the center of this place. Fes, the soul of Morocco, is famous for preservation of many historical buildings. It is home to the world’s oldest university too. A great mixture of spirituality, colorful culture, delicious dishes and good quality products makes everyone feel welcomed. Just adjust to the pace of this city and you will be able to feel the charm of the city in its most unexpected ways.